I was blessed to serve for many years as an award-winning disaster relief specialist, turn-around management expert and Community Economic Development official for the US Department of Housing and Urban Development. I served under 5 US Presidents with assignments in Mississippi, Missouri, Virginia, Ohio, Detroit, Chicago and Kankakee, Illinois. It was a very sad disappointment to me when I realized that the US political agenda was driven by, if not controlled by special interests, regardless of which party was in power. In the far distant past I was politically affiliated, first at the age of 18 with the Young Republicans Party in the then Democratic Mississippi Delta (to support the campaign of a wonderful man who had essentially adopted me after my Father died.) Later in my 20's I registered as a Democrat and in my 30's I began to consider myself an Independent. While I have not been active in politics at all for decades (except for placing a Draft Colin Powell bumper sticker on my car), I have not been able to avoid all the toxicity in the current campaigns for the honor and privilege of serving as President of the United States of America. As a Community Economic Development specialist my focus is on helping individuals, organizations and communities realize and actualize their Ultimate Potential. I also hold a vision of A United State of Americans and am helping establish The Foundation for A United State of Americans to help Fulfill the Ultimate Destiny of the USA, which by the way Benjamin Franklin said was not power but LIGHT! Over the past few months of constant coverage of many candidates including (but not limited to) Donald Trump saying things that I personally find to be ignorant and arrogant, a few phrases and ideas for domain names came to mind such as www.ignorarrogant.com and www.ignorarrogance.com. Lately as some world-leaders have expressed concerns about the possibility that Mr. Trump may become President, I was reminded of the book The Ugly American first published in 1958. I began to wonder: If Elected Would "The Donald" Be A Great President or The Rude Ugly AMErican President? One recent morning as I was checking availability of domain names, those thoughts led me to buy the ones that had popped into my head. As I checked out of the cart to buy them, I considered for the first time ever paying extra for the added security of Private Domain Registration! That was shocking to me because I realized it was because I was afraid of Donald Trump! After seeing how he viciously attacks ANYONE and EVERYONE who says anything negative about him, I was actually afraid of what he might do to me even though I am only an individual private citizen exercising my First Amendment Rights. After contemplating the feelings and emotions of fear of what might happen if I went ahead and bought the domain names and actually did anything with them, I did so but I selected the Private Doman Registration. Then after still continuing to feel fearful of what a candidate for the highest office in our Nation might do to me, I realized that I had to take a stand and had to share how I felt and encourage more civil and solutions oriented conversation in the election. Please note that I am not supporting or working against any political party or individual candidate! What I AM FOR and am seeking is any possible way to encourage, help facilitate and "stand-up" for a more positive, civil and solutions oriented dialogue in the 2016 Presidential campaigns AND throughout every level of government in the United States. 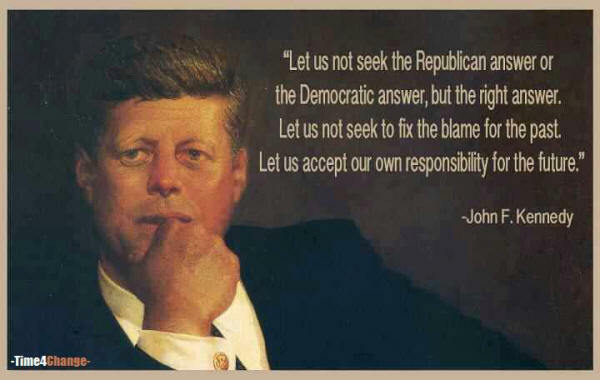 I love the JFK quote above and share the sentiment that each of us and every elected national official should remember we are first an American, then affiliated with a political party. In response to those results, several successful Community Resource Centers have been established and now Universal Stewardheirship, Inc and Ultimate Destiny University are launching the Expanding the Circle of Success campaign to help establish a network of locally initiated non-profit CAN DO! Community Economic Development Empowerment Resource Centers. Click Here for a few excerpts from newspaper articles about training programs produced by CAN DO! and the Community Development Resource Center and visit www.candoresourcecenter.com. As I reflect on the current state of affairs at the local, State and National levels, it seems to me that the same questions and answers are especially relevant today! Again as I look at the social, economic and environmental challenges we face at the local, State, National AND global levels, it seems to me that those root causes of the problems and the potential solutions my CED classmates and Identified 25 years ago are even more needed in these days. . . Awakening to our spiritual identity. Harnessing our creative mind power. Flowing our energy to solutions rather than problems. Remembering who we really are and why we are here. Fulfilling our life purposes and missions. Making a difference and leaving a legacy. Maintaining a positive mental attitude. Loving, serving and blessing others. Applying creative thinking and problem-solving. treasures entrusted to us by God/Spirit/Source/Creator. Our ultimate vision for America is seeing (and helping) it fulfill its ultimate destiny as envisioned by Ben Franklin and as inscribed on the Statue of Liberty. We understand that is something like “Liberty, enlightening the world”. “The destiny of AMERICA is not power, it is Light”. for Self-help, Empowerment and Capacity Building. The Resource Centers will educate, equip and enable individuals, organizations and communities to realize more of their potential and expand their capacity to help solve the social, economic and environmental challenges we face together on what Buckminster Fuller referred to as SpaceShip Earth and "betterment for 100% of humanity." By providing expanded access to development training resources and "successful living skills for the 21st Century" including "infopreneurship" individuals, families and communities will be strengthened, jobs will be saved and created, and America will fulfill its ultimate destiny. profound thinkers, two questions – What’s wrong with our world? and What can we do about it? How can we help manifest what we refer to as Earth StewardHeirShip? (1) What IS RIGHT about the United States of America? (2) How can we work together to make it even BETTER? Loraine's visionary statement and the inspiring words from the song Earth by David Roth encompass our ultimate vision and mission of fostering personal, community, national and global transformation. We seek to accomplish that by providing expanded access to state-of-the-art resources for Community Economic Development training while incorporating CED principles of Self-Help, Empowerment and Capacity Building. I love what Ernest Holmes had to say about Love and Cooperation in business AND I am optimistic enough to believe that it may also be possible for us to one day discover that practicing Love, Cooperation, and Respect for divergent perspectives and policies in our government might help us Fulfill the Ultimate Destiny of the United States of America! 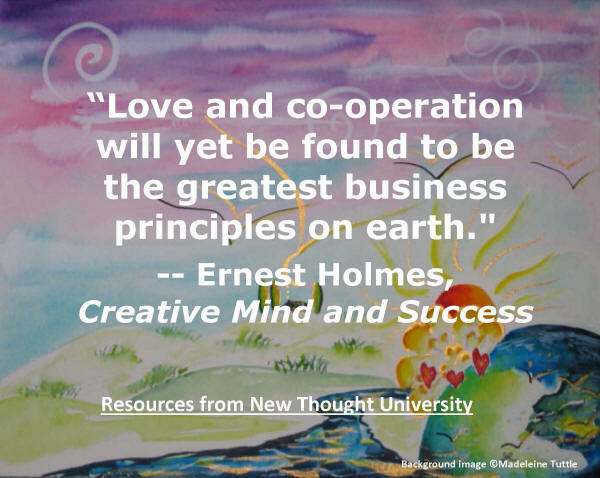 There are many wonderful resource available to help us learn how to practice love and cooperation including The Love Center, The Love Foundation and the Global Coherence Initiative. Earl Nightingale, the “Dean of Motivation” and co-founder of Nightingale-Conant (the World Leader in Personal Development since 1960) told a story about a father who was trying to work who had a young son who wanted to play. The father cut a picture of the world out of a magazine and made it into a jigsaw puzzle. He gave it to his son and told him that they could play when he had put the puzzle back together. The Community Economic Development Benefit Corporation and and Ultimate Destiny University are fostering the realization of human potential and helping “Expand the Circle of Success” to help people learn how to learn, especially those who may have had limited experience with development training materials. We are helping these individuals learn how to put their own “success puzzles” together. And just like the story about the father and his son, as the individual pieces come together for each person, the puzzle for the whole world begins to come into focus. Because we see a correlation with strategies for enhancing opportunities for personal, community and national development and empowerment, we want to share our vision with you and invite your participation helping resolve our personal, political and religious differences, and come together to solve the challenges we face AND take advantage of the rich opportunities that lie before us. 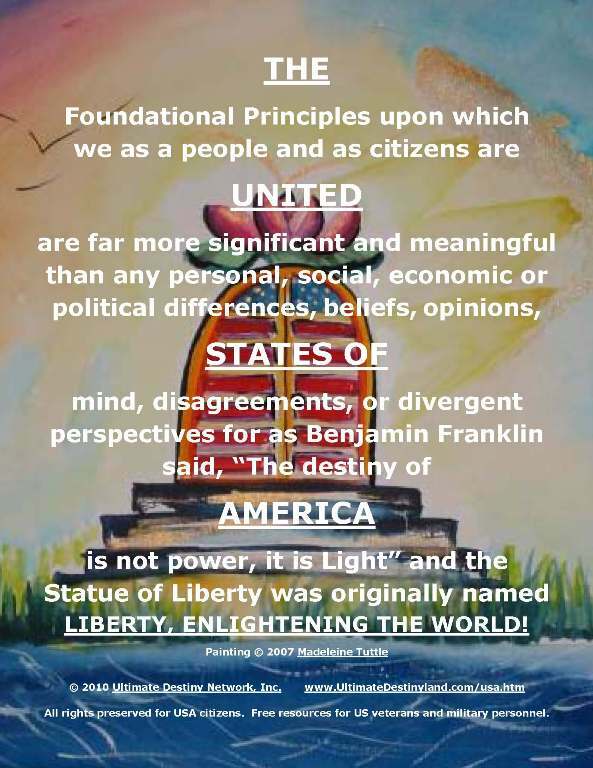 THE Foundational Principles upon which we as a people and as citizens are UNITED are far more significant and meaningful than any personal, social, economic or political differences, beliefs, opinions, STATES OF mind, disagreements, or divergent perspectives. As Benjamin Franklin said, “The destiny of AMERICA is not power, it is Light”, and the Statue of Liberty is named LIBERTY, ENLIGHTENING THE WORLD! We are all evolving human beings. We live and work in one global economy. 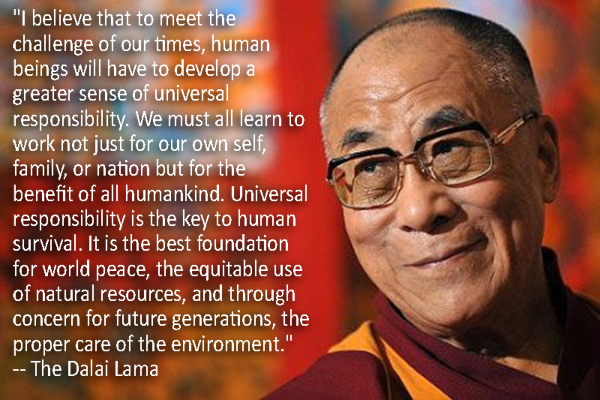 We are all spiritual beings having a human experience. We move through space together at thousands of miles per hour. We are all Americans first, living together in One Nation. As we remember our rich legacy and fulfill our ultimate destiny. Once again we hold these truths to be self-evident as we collectively remember, honor and fulfill the ultimate destiny entrusted to us as citizens of the United States of America, one nation under God, with Life, Liberty, and Happiness for all. Our ultimate destiny as citizens is to actualize our inherent potential, individually and collectively, to help empower, enlighten and evolve ourselves, our brothers and sisters and the global community we share that Bucky Fuller referred to as Spaceship Earth. of Life, Liberty and Happiness for all. 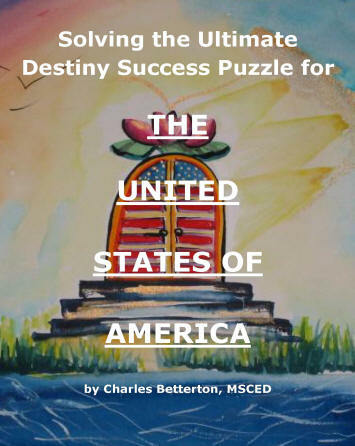 The ultimate destiny of the United States of America is to enlighten, empower and elevate our consciousness to the realization that we are one people, living in one global community, with only one future that we are destined to co-create together. A Call To Action and Invitation! Let us come together in spite of any political, geographic, religious or cultural differences and contribute our time and energies toward further evolution of a "more perfect union" as the Greatest Nation on Earth of the people, for the people and by the people. Perhaps we can benefit from Arthur Morgan's description of The Great Community and apply that to The Greatest America Ever! "Where there is no vision, the people (and or the Nation) perish.' So it is with communities and Nations! Americans have had no great expectations of theirs, and have had no picture of what a great community or Great Nation might be like. The hope of the small town has been, not to be a great community, but to become a city. Seeing our communities as of little importance, we have neglected them, robbed them, and fled from them. Only as we come to see them as the sources of population and of national character and culture, and as possible centers of interest and opportunity, will our young people choose them for their life careers. Economic and social security are not enough. If a community is to hold its boys and girls, building with them a great community, it must be to them a place of significance and of high adventure. Because economic security is so generally lacking, many have felt that if a whole community should be economically secure, other limitations would disappear and the good community would emerge. Yet often where economic security has existed the community has been uninteresting, if not banal, and young people have fled from it. Other communities, with the idea that education is the magic key have staked their hopes on schools and colleges, only to find their young people driven from home and burdened with student loan debt to seek careers. There have been many ethically fine communities in which nearly every family lived in a spirit of good will. Believing that fine human relationships is the one essential of a good community, they rested on their fortunate condition. Young people of such communities, finding few home opportunities for adequate careers, and lacking a vision of the Great Community, left for more promising fields. In this manner, many fine communities have been almost depopulated. The Greatest handicap to human progress has been a partial view of life. When people set their hearts on achieving some particular excellence, their success has sometimes been remarkable, but the resulting lopsided development has often resulted in social breakdown. All-round growth may be slower and less spectacular, but is more enduring. That is true of communities as of people. The Great Community and Great Nation must be built on a full all-round view of life and its possibilities. The Great Community and Great Nation will achieve a living unity. It will not be just an aggregation of individuals, families, congregations, firms, cliques, and interests. Holding that 'that which unites us is greater than that which separates us,' it will develop unity of outlook, purpose, and program without thwarting individual or group autonomy. 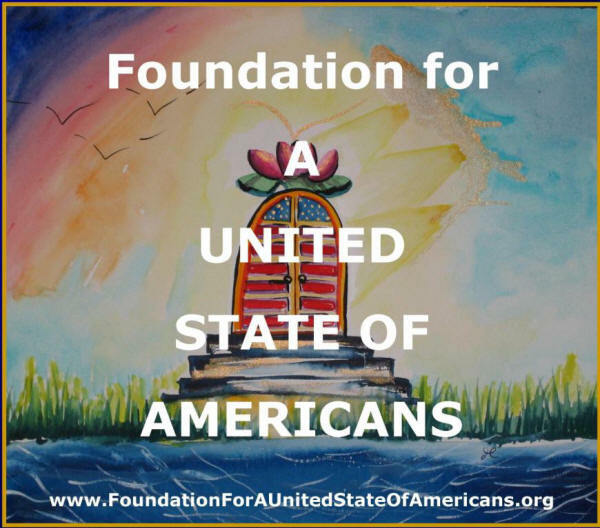 Its various organizations will not tear the community or Nation apart to advance themselves or their political party, but will be agencies of an enlarging and unifying community life and fulfillment of the Ultimate Destiny for the United States of America!" Arthur Morgan wrote The Small Community and The Great Community in the 1940's. He founded Community Service, Inc. and served as President of Antioch College in Yellow Springs, Ohio. What IS RIGHT about America? What can we do to make it better and how? How can we overcome our differences and work together? What do you believe is The Ultimate Destiny of the USA! 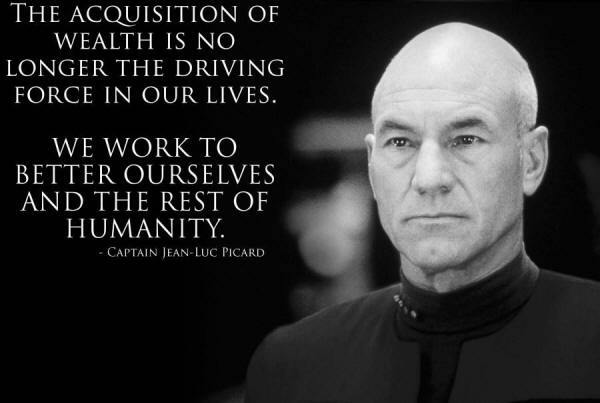 How would you like to help "Make it so" as Captain Picard would say? As you think about Americans (still alive or not) who have demonstrated a love of country ahead of personal or political interests, dedicated their lives and or careers to public service and who helped promote cooperation, collaboration and effective communication, who would you recommend for The United State of Americans Hall of Fame Award? Would you like to learn about how "cause-oriented" companies (based on the new Benefit Corporation model, Community Economic Development Principles and the 4Ps of Purpose, People, Planet and Profitability) could generate up to a million dollars a year through the Equity Crowd Financing provisions of the JOBS Act AND help make America better, stronger and more prosperous for all Americans? Thank you for taking time to review this web page and to complete the survey!